One 1000 hp (746 kW) Nakajima NK1B Sakae 11 fourteen-cylinder air-cooled radial engine driving a three-bladed constant-speed metal propeller. 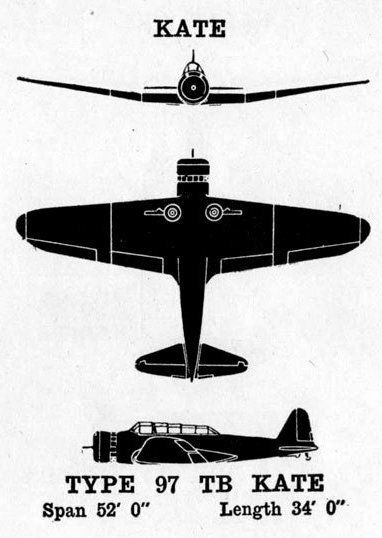 The B5N2 used a 1115hp Sakae 21 engine and was armed with dual flexible 7.7mm in the rear cockpit and two 7.7mm fixed above the forward fuselage. 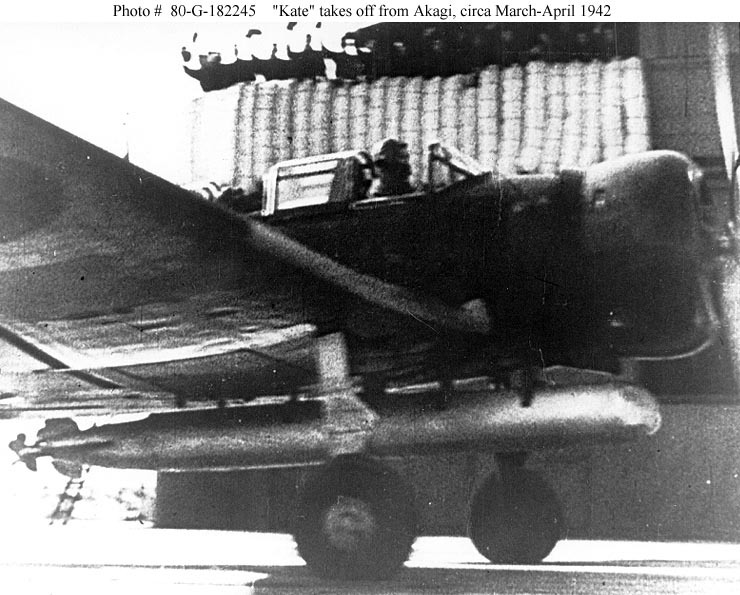 Also known as the Type 97 Carrier Attack Bomber, "Kate" was the standard Japanese torpedo bomber at the start of the war. Though the design dated back to 1935 and was considered obsolescent by 1941, it remained the most important light bomber in Japanese carrier air groups until 1944. 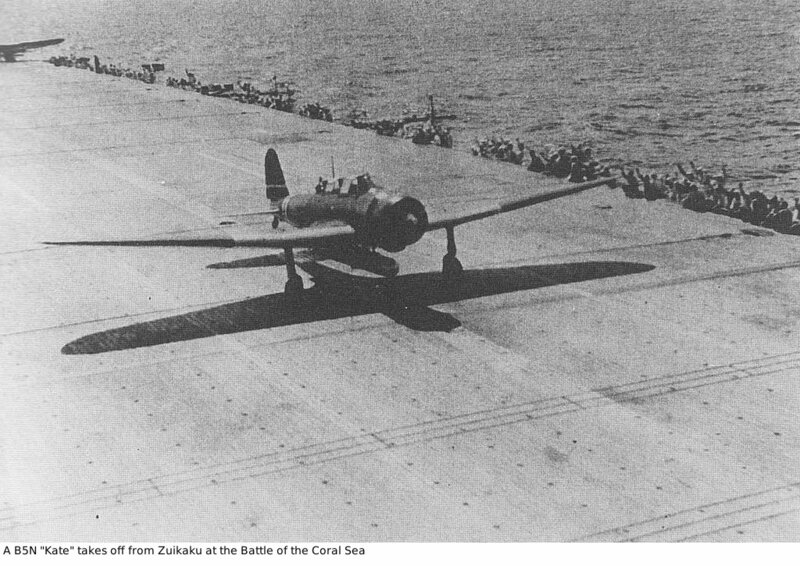 A Japanese fleet carrier air group typically included a torpedo bomber squadron of up to 27 "Kates", reflecting the importance the Japanese Navy assigned to torpedo bombers. 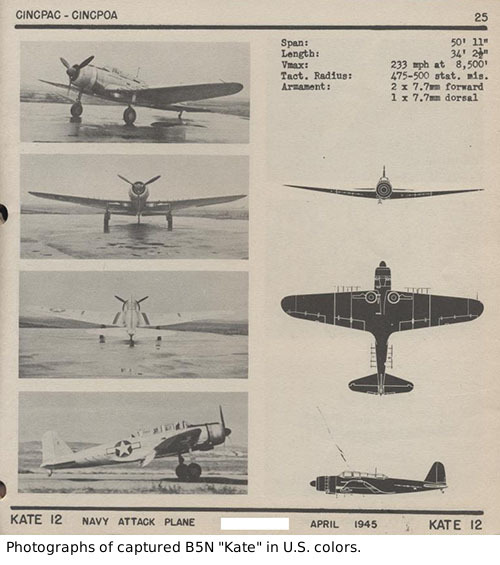 "Kate" introduced a number of important innovations to Japanese carrier aviation, including retractable landing gear and wings that could be folded at their midpoints for carrier stowage. The original design also featured Fowler wing flaps and hydraulic folding wings. Both proved problematic, and they and were replaced with conventional flaps and manual wing folding. 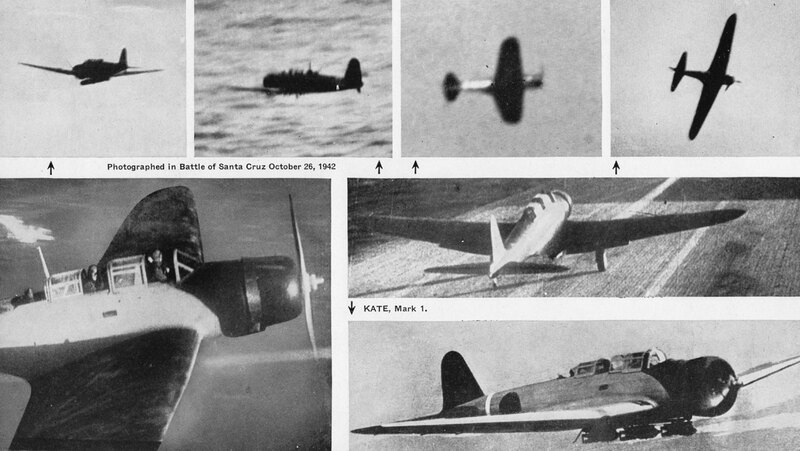 "Kate" saw its first combat over China, where it was escorted by A5M "Claude" fighters and performed well in the ground support role. Equipped with a robust and reliable aerial torpedo, the Kate sank more Allied ships than any other aircraft type. However, like most torpedo bombers, "Kate" was slow, clumsy, and vulnerable to antiaircraft and fighters. A particular weakness of the original model was that it had no forward-firing guns whatsoever. The normal crew was three, but the observer in the second seat of the tandem cockpit was sometimes left behind to save weight. 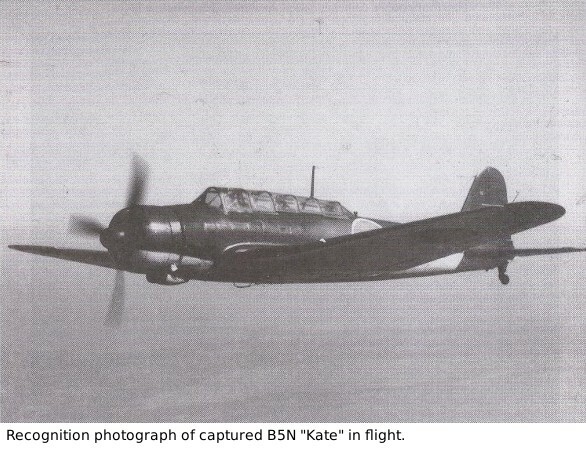 After "Kate" was replaced in front line service by the B6N "Jill", the surviving aircraft were relegated to reconnaissance and antisubmarine duty. Some were retrofitted with surface search radar (as in the example shown in the first photograph) and magnetic anomaly submarine detection gear.